NASA's MISR Instrument Captures Stereo View of Mountain Fire Near Idyllwild, Calif. 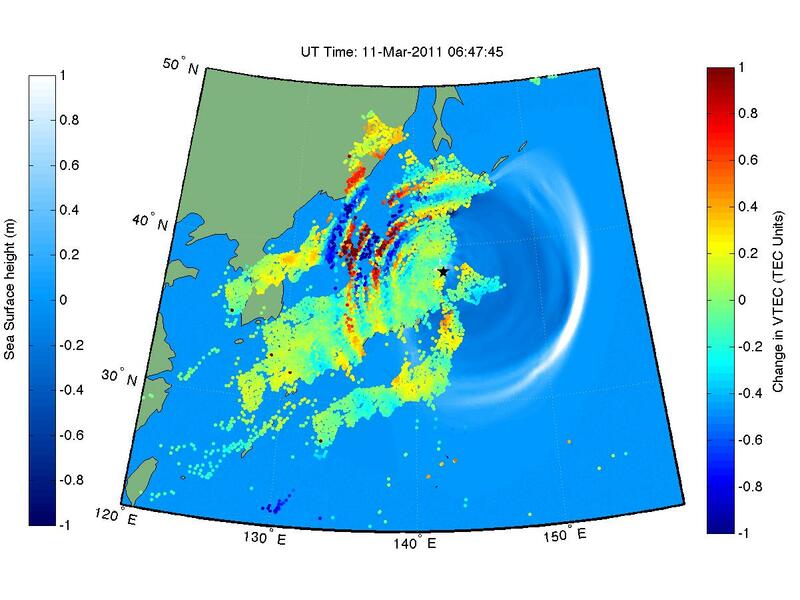 This animation shows how waves of energy from the Tohoku-Oki earthquake and tsunami of March 11, 2011, pierced through into Earth's upper atmosphere in the vicinity of Japan, disturbing the density of electrons in the ionosphere. These disturbances were monitored by tracking GPS signals between satellites and ground receivers. 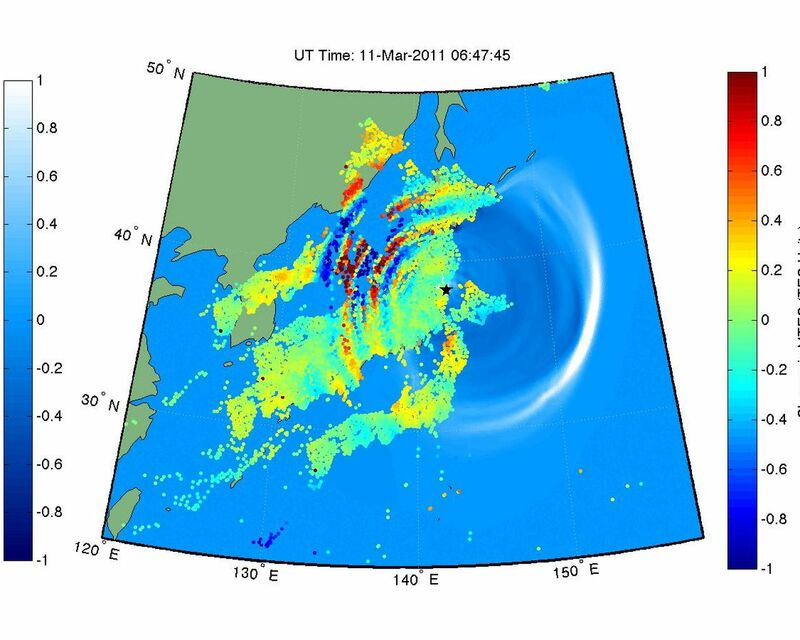 The disturbance measurements, known as vertical total electron content (VTEC), have been filtered to show wave-like disturbances in ionospheric electron density with frequencies between 0.5 and 5 milihertz (periods between 33 minutes and 3.3 minutes), similar to the frequency of a tsunami. The locations of the colored points in the animation correspond to the region of the ionosphere being monitored by the GPS receivers. Each receiver (there are more than 1,200 in Japan) can simultaneously receive signals from approximately 12 different GPS satellites, and hence we can monitor a wide range of locations in the ionosphere. (The motion of these Japan-shaped "clumps" is due to the motion of the GPS satellites in the sky, and is not related to the earthquake and tsunami. Rather, it is the changing color of the dots corresponding to the disturbed ionosphere.) 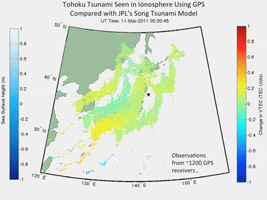 This analysis has been done previously for the Samoa 2009 and Chile 2010 tsunamis [Galvan et al., 2011], but the Tohoku 2011 event represents the first time a major earthquake and tsunami have occurred in a region where the ionosphere over the epicenter was being observed by such a dense network of GPS receivers. A model of ocean tsunami wavefronts [Song, 2007] is overlaid in blue to show the correlation between variations in the ionosphere above and ocean surface below. Note that traveling ionospheric disturbances (TIDs), visible throughout the animation, are correlated with the position of the tsunami. The earlier TIDs are likely associated with acoustic (longitudinal) and Rayleigh (transverse) waves caused by the earthquake itself, while later, slower-moving TIDs may be associated with atmospheric internal gravity waves caused by both the earthquake and the tsunami. The colorbar at right shows the magnitude of VTEC perturbation in the ionosphere in TECU (1 TECU = 10^12 electrons per square centimeter), while the left colorbar shows the size of the sea surface waves, in meters. The main shock of the earthquake occurs at 05:46 UT (soon after the start of the movie). The earthquake disturbs the atmosphere, creating acoustic and Rayleigh waves, which propagate up to the ionosphere (reaching a peak in ionization at an altitude of 300 kilometers) within 10 minutes after the quake. These fast-moving waves (1,000 meters per second for acoustic, 3,400 meters per second for Rayleigh) are visible in ionospheric Total Electron Content (TEC) measurements, as annotated in the movie. 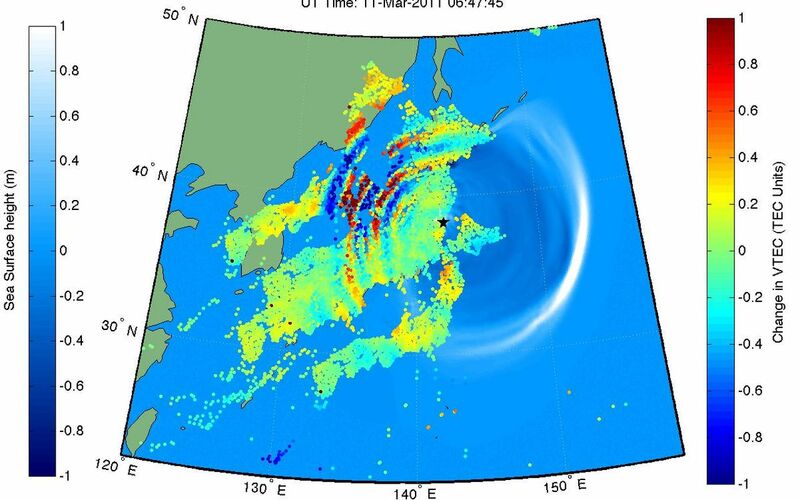 The tsunami also disturbs the atmosphere, creating gravity waves that take approximately 30 to 40 minutes to reach the ionosphere. These gravity waves match the horizontal speed of the tsunami at the time they were generated, moving 200 to 300 meters per second. The annotations point out gravity waves as observed in the ionosphere, sometimes aligning with the modeled ocean tsunamis (shown in blue). Note the gravity waves traveling over and to the west of Japan, despite the tsunami stopping at the coast. It is likely that the gravity waves persisted in the ionosphere for some significant amount of time after the ocean waves stopped. 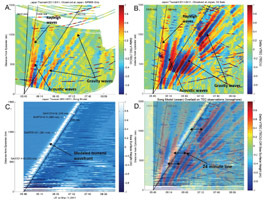 This series of four images shows several travel-time plots illustrating the observed ionospheric perturbations and modeled ocean tsunami within 1,500 kilometers of the earthquake's epicenter. Figure B (upper right) is the same as Figure A, but shows data from all available satellites, not just SVN55. Figure C (lower left) shows the Song tsunami model, for comparison of the wavefront on the ocean surface with the ionospheric observations. Figure D (lower right) shows Figure C overlaid on Figure B. Note that for a given geographical distance from the epicenter, the ionospheric disturbances are passing by roughly 24 minutes after the ocean tsunami. This may be due to changing tsunami speeds with varying ocean depths, causing the ionospheric signature to not match the ocean tsunami position exactly at any given time, due to the time necessary for the gravity wave to reach the ionosphere. Galvan, D. A., A. Komjathy, M. P. Hickey, and A. J. Mannucci (2011), The 2009 Samoa and 2010 Chile tsunamis as observed in the ionosphere using GPS total electron content, Journal of Geophysical Research (Space Physics), 116, A06,318, 10.1029/2010JA016204. 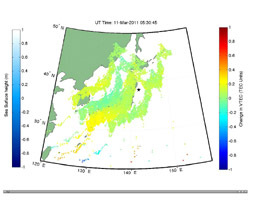 Song, Y. T. (2007), Detecting tsunami genesis and scales directly from coastal GPS stations, Geophys. Res. Lett., 34, L19,602, 10.1029/2007GL031681.